West Garage Models (WGM) offers many unique scenery and diorama models. 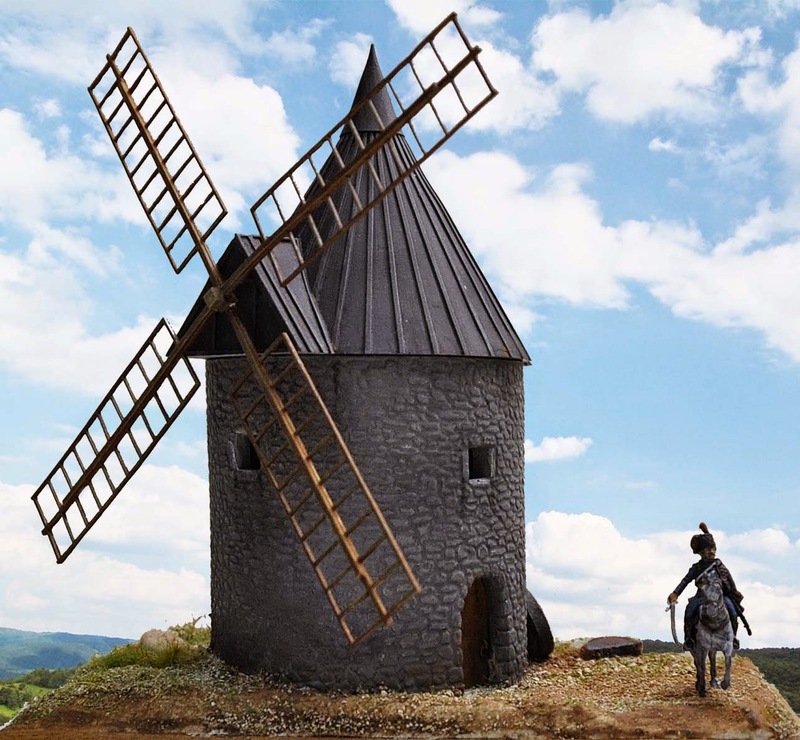 Item R72009 is a 1/72 French Windmill (Moinho francês), a kit of resin, laser-cut wood, and a metal axle. West Garage Models - formerly GEM - produces a variety of models and accessories. Our history goes back to December 2nd of 2009 with GEM (Garage Exclusive Models). It starts with a small and simple resin kit, then another and then the diorama material, and bit by bit, we end up with a solid catalogue. Now, a change, a new image, a new name. The catalogue still has the same products and will have a lot more. French Windmill arrived packed in a cardboard box. Despite rough handling by the postal services the kit arrived undamaged. WGM is transitioning from the previous GEM labels so some models still sport those graphics. 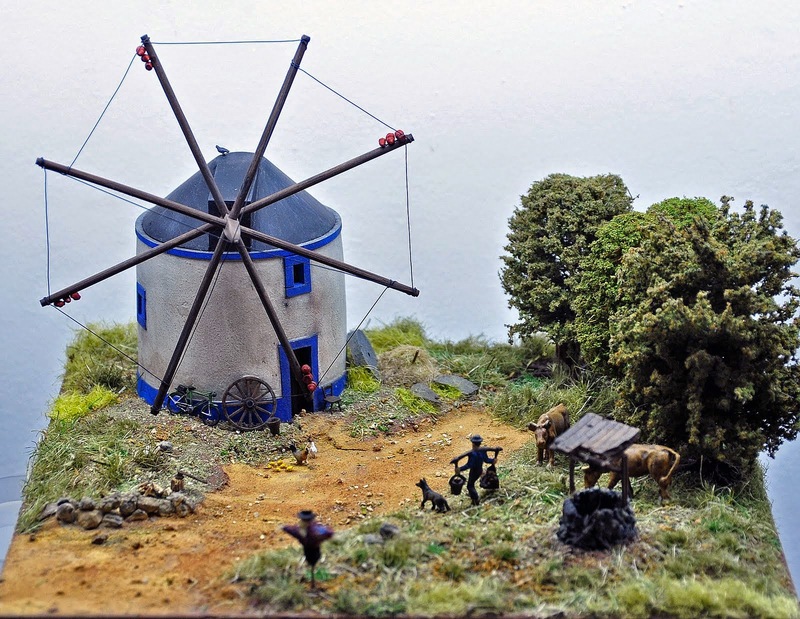 The model is of a tower mill. A characteristic of the tower mill is the fact that the entirety of its mechanism is situated under the cap. There are no assembly instructions or painting suggestions. For reference, please enjoy the photos of the windmill around the village of Lupiac, generously provided by Tim Hatton [litespeed] for this review! The sails are laser-cut from 0.5 mm or 0.25 mm plywood. They have a twist - or "pitch" - to them, like an aircraft propeller. You will have to drill the hub for the metal shaft. Cast with a straw colored resin, the tower, cap, and other components are sharply made. No pieces are attached to a pour block. Only the tail pole castor wheel has noticeable flash. The windows have a resin film across them but it is so thin and easy to remove without any risk to the part that I don't consider it as flash. The roof cap fits neatly to the tower. Recessed stone detail details the tower. The cap and roof are smoothly cast with crisp detail, including the wedge fantail opposite the sail cowl. I do not know what the roofing was made with but there is no texture on the kit roof. Fine wood grain details the tail pole. That piece is warped, which at first disturbed me. Then I looked up images of French windmills and noted that tail poles were big beams, and many were bowed, as it the kit tail pole. The door features wood pattern and hinge and handle detail. It seems that this unique model by West Garage Models will be a quick and easy model to assemble. Probably the most difficult part of building it will be painting the stone work, lest one chooses to represent rocks of unvarying color. Casting is first rate and detail is impressive, too. I can not say for certain if there should be more cap detail. This kit lacks any assembly guidance aside from the box label. Preparing assembly instructions is time consuming and expensive for cottage industries. So I will not worry much about the lack of instructions unless I build the model wrong! The Pointe-Claire mill, in common with most mills in New France, was built to a popular French design. It was a tower mill, a cylindrical fixed stone structure with a wooden pivoting roof that enabled the wings to be oriented into the wind. The Pointe-Claire tower mill's stonework is made of quarry stone. The walls of the mill were 4 French feet (1.30 m) thick at the base. Inside, the mill measured 12 French feet (3.90 m) in diameter by 24 French feet (7.80 m) high. A French foot equals 1.06575 English feet or 32.484 centimeters. Built at a time when fear of the Iroquois was still rife, that mill was also designed to serve as a redoubt in case of attack. The walls are pierced with many loopholes which confirm its military function. The mills in Senneville (West-Island) and Pointe-du-Moulin (Île-Perrot) also have loopholes. A characteristic of the tower mill is the fact that the entirety of its mechanism is situated under the cap. Although the Pointe-Claire mill has since lost its mechanism, we still know how it operated. The orientation of the wings into the wind is made possible by a movable roof or cap rotating on a wooden winding track built out of oak and greased with suet thanks to a long tail pole. The brake wheel, a large gear wheel set in to the windshaft, transferred the force of the sails to the wallower (another gear), which then transferred the force to a vertical axis, the quant or top spindle. This spindle turned the runner stone resting on top of the bedstone. We thank West Garage Models for sending this model for review here, on - ARMORAMA! * "Pointe-Claire, The Mill." Société Pour La Sauvegarde Du Patrimoine De Pointe-Claire. n.d. Web. 17 Mar. 2015. . Highs: Casting is first rate with impressive detail. Laser-cut sails. Verdict: I look forward to assembling this neat and well made Moinho francês kit. It should be a real attention magnet for 'braille scale' models of 1/72 through HO ( 1/87). Our Thanks to West Garage Models!